SIMFEROPOL, October 7. /TASS/. The construction of a transport corridor linking Crimea with mainland Russia will be completed despite Western pressure and possible new round of sanctions, the Crimean republic’s acting head said on Tuesday. “We are doing our part, the land-based passage — the Kerch Bridge. The bridge will be built, and the tunnel will be constructed. All the decisions by the president will be fulfilled,” Sergey Aksyonov told reporters. The statement comes in remarks to calls by Federica Mogherini, the EU incoming foreign policy chief, to increase sanctions against Russia and prevent the construction of the key Kerch Bridge. Aksyonov said in case of further EU sanctions, the Crimean government may consider banning European diplomats from entering the Black Sea Peninsula, which rejoined Russia in mid-March. “They always want to hamper Crimea or the Russian Federation. In my opinion, this is a pet project of certain Western leaders. 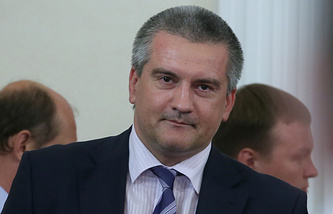 Let them deal with their own issues,” Aksyonov said. “If they adopt these sanctions, we will therefore announce sanctions banning the entry of foreign diplomats to Crimea, we will declare their presence as undesirable on the territory of the republic,” he stressed. Mogherini, who is about to quit the post of Italy’s foreign minister and replace Catherine Ashton, claimed on Monday the EU sanctions are beginning to bite and the Russian economy allegedly “is starting to suffer quite a lot,” although she admitted that she is in big doubt whether or not they have exerted any impact on the policy line maintained by President Vladimir Putin. She also said the European Union should be united and act in solidarity in an effort not to prevent the construction of the Kerch Strait Bridge. 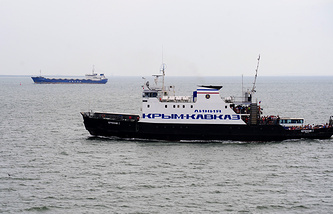 Ukraine and Russia agreed to build a bridge linking southern Russia's Krasnodar region with the Black Sea peninsula in April 2010. After Crimea joined Russia, the Russian government decided to construct the transport corridor on its own. The project worth $5.9 billion is due to be completed by 2018. It is expected to include a road with four lanes of traffic and a two-track railway. The length of the crossing is estimated at about 19km (11.8 miles). Federal Road Agency (Rosavtodor) is responsible for the project's implementation. The Kerch Strait links the Black and Azov Seas and separates the eastern end of Crimea from the Russian territory. The body of water, about 4.5km (3 miles) wide, can now be crossed by ferry.